Filtrex is strongly committed to supply products with quality characteristics always compliant to customer requirements. Customer satisfaction is our goal, achievable with a dynamic implementation and the continuous improvement of our ISO9001 Quality System, certified since 1995 from Lloyd’s Register. Quality management is fully integrated into all business processes and it is a significant factor in our global success. ISO3834-2 Certification for Welding activities, ASME U-Stamp Certificate of Authorization and PED Certification for pressure vessel design and construction complete the scenario of our Quality. 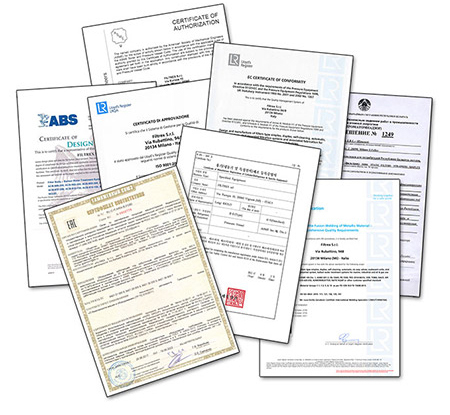 Job related surveys from other main notified bodies such as DNV-GL, ABS, Bureau Veritas, TÜV and many others are also performed for the conformity assessment of our products.